Flying from Rotterdam Airport soon and need parking? 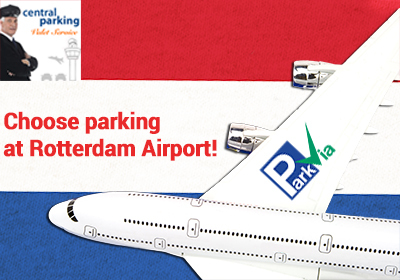 Now you can pre-book Meet & Greet parking online for Rotterdam Airport, simply by visiting the ParkVia website. Centralparking Rotterdam Airport offers a fast and easy to use Meet & Greet service at an affordable price. On the day of your departure, simply call the car park 15 minutes before your arrival to arrange for a driver to take your vehicle to the car park's secure compound. On the day of your return, just call the car park as soon as you have collected your luggage to arrange to have your car waiting for you when you reach the airport terminal exit. Centralparking Rotterdam Airport is situated just 15 minutes away from Rotterdam Airport, and fully fenced and protected by CCTV for your safety and security. The car park is also staffed 24/7 which means you can drop off or pick up your vehicle anytime day or night. So for peace of mind and a hassle-free travel experience, why not pre-booking your booking in advance today? Places are limited, so be sure to book in advance to avoid stress on your departure day. **Prices based on 11am Friday 27th February 2015 and 11am Thursday 5th March 2015.